Stimulate and reinforce gums,while resisting plaque formation. 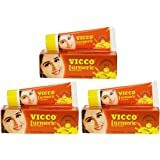 Vicco vajradanti ayurvedic tooth paste is an Ayurvedic medicine for gums and teeth .Vicco vajradanti offers this unique formula in a dental care paste that has natural astringent,antiseptic,and analgesic properties. 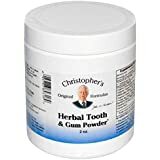 These ingredients also stimulate and reinforce gums,while resisting plaque formation. 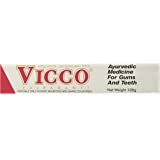 I started using this toothpaste about 25 years ago out of curiosity when I saw it in a neighborhood Indian grocery. I haven't been able to find it lately, and I was glad to find on Amazon. I love it because of the flavor - no artificial sweetener aftertaste, not too strong, not too sweet. 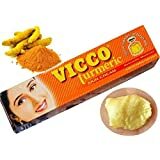 Then a friend saw it in my house and became very excited because it was ayurvedic and he couldn't buy it where he lived, so he stocked up on it in my local store. I hadn't paid attention to its health claims, but I do have very healthy teeth and gums, so maybe they're true! After the first week I noticed a reduction in my gums swelling and the pain reduced. After one month it was completely gone. My pain was so bad it hurt to eat but the dentist kept telling me I didn't have gum disease so I searched for my own remedy. I also bought a dental cleaning kit from the dollar store and used the metal picker (dont know what is it called) after I eat to get rid of what my floss wasn't removing. 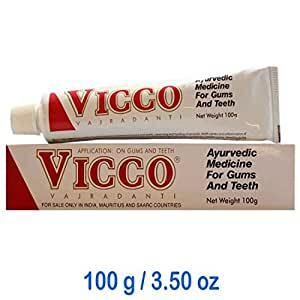 I also used CIOSYS mouth wash in combination with this toothpaste. Between the two, my swollen and sensitive gum problem is completely gone! 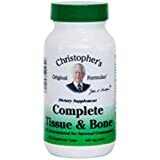 4.0 out of 5 stars!00g size is good for travel. 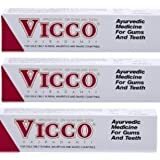 I have used Vicco for over twenty years. It's been out of stock at the local indian market more often than not. So I ordered from amazon this time. The product was what I have come to expect, but I should have paid more attention to size. The 10g tubes are ok for travel but I had been buying the larger size in the store. I will order larger next time. Husband LOVES this toothpaste. It is the only toothpaste tjat relive his pain. Toms of Maine does not co pare for him. Has a sweet herbal tastse. I love this toothpaste. It makes my mouth feel clean.